Don’t just know where it is know how to use it! O2 Provider Manual for scuba lessons. The PADI Emergency Oxygen Provider Manual is an important component of PADI’s Emergency Oxygen training program. Before class, you’ll review a step-by-step explanation of when and how to provide emergency oxygen. You’ll also learn about safety considerations, and how to assemble and disassemble emergency oxygen equipment. The care-at-a-glance card is a quick reference guide to pack in your gear bag and review in case of an emergency. 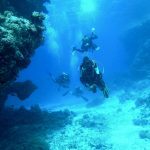 Scuba lessons allow hands on O2 training. The Emergency First Response certification, which covers CPR and first aid, pairs perfectly with the Emergency Oxygen Provider course.